When I embarked on writing what would become my latest novel, I did not set out to write about Indigenous characters. I began composing a work of straight-up horror, hoping to be the next Stephen King. But that’s not how In Case I Go turned out. The connection between where I started and where I ended seems obvious now. After all, Canada’s treatment of its Indigenous peoples is horrific. But my own line was not so straight. I floundered. The supposed horror novel morphed into a story about the ways we’re haunted – by addictions, by genetics, by our ancestors’ mistakes. My narrator buckled under the weight of his great-great-grandfather’s misdeeds, particularly the exploitation of the environment and betrayal of a young Ktunaxa woman. I wrote, as I often do, without knowing exactly what I was writing. 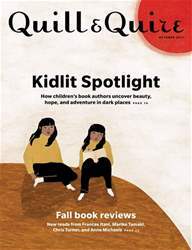 Kidlit Spotlight: how children's book authors uncover beauty, hope, and adventure in the dark places; Fall book reviews: New reads from Frances Itani, Mariko Tamaki, Chris Turner, and Anne Michaels.